Tomatoes, basil and parsley make good asparagus companion plants.That is if you belive in companion planting. There is little or no evidence based on scientific trials to support the premise that planting certain plants together encourages them either to flourish or suffer but many gardeners have their own theories developed over time and trial and error. 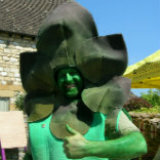 It seems unlikely that so many gardeners would agree on some of the basics were there not some truth in the theories. Providing shade and supressing weeds around the feet of another plant to reduce competition for nutrients and water. 2. Then there are plants which do not go well together sometimes called antagonists, this may be because they give off a chemical or smell that affects the other plant or they may share a disease which can consequently spread or they just plain don't like each other!! 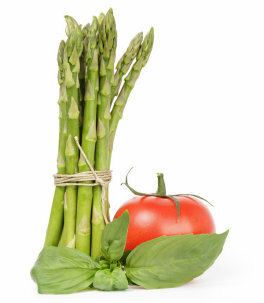 One of the most commonly cited alliances is that between asparagus and tomatoes. It appears that both benefit when grown in proximity. It is suggested that this is because the tomatoes give off a chemical (solanine) that deters asparagus beetle whilst the asparagus is said to produce a chemical effective on nematodes. If you want to make this work plant your tomatoes between the asparagus plants just after you have finished harvesting or around or alongside the asparagus bed depending on what space you have. 10 other plants that are said to be beneficial to the growth of asparagus include basil, parsley, marigolds, spinach, flowers of the aster family, lettuce, beets, grapes, nasturtiums and dill. Of these the most commonly cited is basil which is said to attract whitefly away from tomatoes and deter tomato hornworms and also work well with asparagus. Of course if you are going to plant tomatoes with your asparagus you need to cross check the other plants that are beneficial to asparagus to make sure they are not harmful to tomatoes. Marigolds, Basil and Parsley seem to be a trio that are all good for both asparagus and tomatoes. Whilst garlic and onions are said to be beneficial to tomato growing they are reputed to have a negative impact on asparagus so might be best kept in a different part of the garden. Potatoes are said to have a negative impact on both asparagus and tomatoes so grow them at the other end of the garden.